Dimensions (HxWxD): 1.75" x 0.35" x 0.25"
We have 25 of these beauties in stock, as you see from the pictures on this page, they are each lovely and unique. 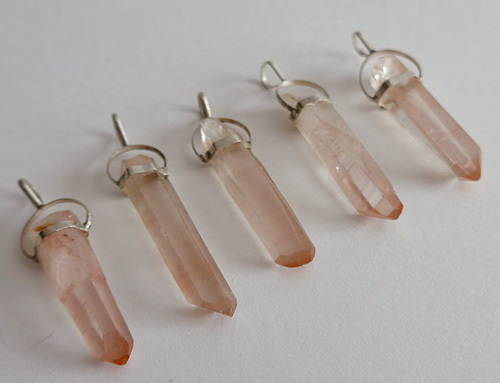 These powerful little stones are perfect for your medicine bag or pouch, ideal for use in meditation or energy healing. We are pleased to offer these at the low price of $25 each. These beauties comes from one of the New Lemurian mines in the Serro do Cobral region of Brazil. 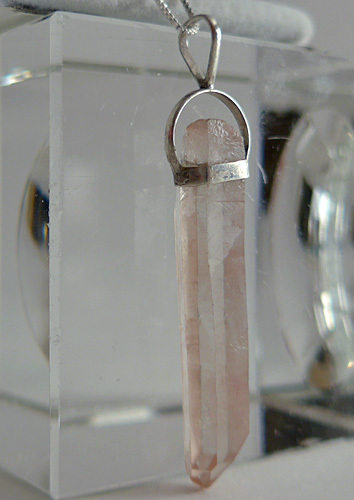 The vast majority of New Lemurian crystals are extremely clear -- these stones have amazing translucence along with the highly prized pink coloration Lemurian lovers associate with the early Lemurians recovered from the original Lemurian mines in the decades ago. Note: weight above is shipping weight. Net weight is 3.6 grams. Each piece is unique & may vary in dimensions & appearance as you can see in the group photo above. Dimensions given at top of page are average dimensions. Each piece is guaranteed to be beautiful and to meet with your complete satisfaction and carry the wonderfully soothing Lemurian energy signature.